This week: a building control Rosetta stone, a bike jacket for the SSL set, and Soraa's fab expansion in Buffalo. Soraa to build out semiconductor fab in Buffalo, N.Y. The vertically integrated GaN-on-GaN LED and SSL lighting company will be one of two smart-energy outfits to take advantage of New York governor Andrew Cuomo's billion-dollar plan to expand industry and jobs in the western part of that state. (Soraa's partner company in this first round is Silevo, a Silicon Valley-based manufacturer of solar photovoltaic cells with manufacturing facilities in China.) Here is coverage on Optics.org and Soraa's press release. The two companies will each invest $750 million, leveraging $225 million from New York State. New York's investment will go to building two (out of a planned six) buildings on a brownfield site formerly used by Republic Steel, and to the purchase of high-tech manufacturing equipment for the two tenants. Cuomo wants to make the Buffalo region a hub for high-tech research, manufacturing, workforce training, and clean-and-green energy research. 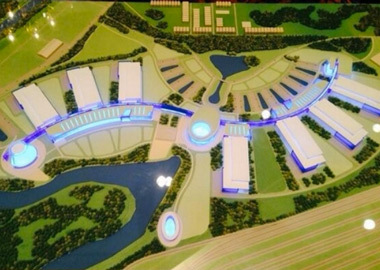 Soraa said it hopes to employ 375 people in Buffalo after construction of its new semiconductor fabrication facility is complete in 18 months. Soraa has received a total of around $100 million in outside investment to date. Looks like the company is in for some serious fundraising. The two companies announced that Balboa will become the go-to source for financing SSL projects for LEDtronics's distributors, contractors, and their customers. A joint press release claims a simple application process: "One-page applications for up to $150,000 in financing can be submitted online, and credit decisions are made within one hour." The financing option now has a top-level link in LEDtronics's site navigation. We've been writing about the growing trend of financing SSL upgrade projects; see the related posts below. Until there is shakeout and consolidation in the crowded field of standards, both open and proprietary, for controlling lighting and other building functions, there will be multi-protocol gateways to translate among them all. Hubble Lighting's latest announcement, for the wiHUBB Building Automation System Gateway Interface, is a case in point. It speaks the proprietary wiHUBB protocol to control lighting, and interfaces with other building control networks that may be present using protocols named BACnet, Metasys, N2 by JCI, and Modbus. Johnson Controls offers a gateway that speaks even more protocols, though it looks to my untrained eye as if they are all about building automation and not lighting. Is it too early to think about Christmas gifts? (Yes, probably.) Here is the LEDs Eclaireur Jacket, a really quite stylish bike jacket with lots of features (as demonstrated in this video), including forward-pointing white LEDs at the shoulders and a string of five red LEDs across the back. 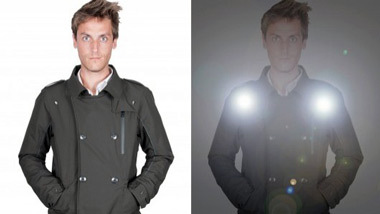 The jacket's maker, Esthete Intelligent Cycle Clothing in France, claims the lights can be seen for 100 meters. It will set you back €600, or €480 without the LEDs. It ships free within the EU. US shipping is not mentioned on the site.